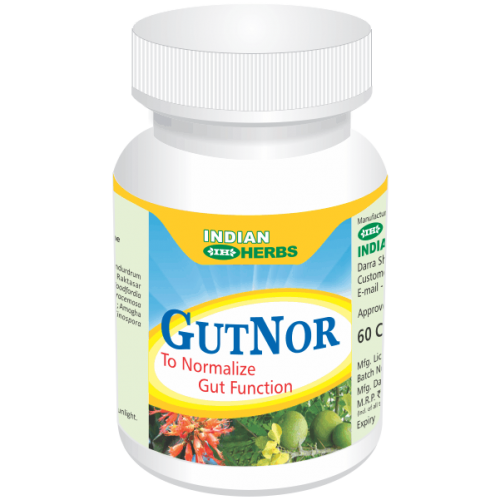 GutNor a polyherbal formulation quickly and effectively controls non-specific diarrhoea and stabilises gut function. It is very useful in Irritable Bowel Syndrome(IBS) and as supportive therapy in Bacterial, Protozoal and Parasitic diarrhoea. Antisecretory action of herbal GutNor prevents fluid accumulation in the bowel lumen and prevents fluid and electrolytes loss. Anti-colonisation action inhibits the colonisation of entero-pathogenic bacteria in the gut and limits the multiplication of potential pathogens and prevents fulminant disease. Enteropathogen Adherence Inhibitor action prevents interaction of bacterial toxins with enterocyte receptor sites and prevents damage to gut and consequent complications. Spasmolytic action of GutNor protects the gut from spasm, slows down and normalises peristalsis safely and naturally and reduces the volume and frequency of stools as well as relieves intestinal colic. Demulcent action provides a soothing and protective coating to the G.I. tract and promotes normal stools and stable gut function. Being naturally safe it does not disturb or destroy beneficial gastro-intestinal microflora and prevents digestive dysfunction and vitamin deficiencies. It can be used as supportive therapy to allow sufficient time for anti-infectives to work to facilitate quick control of infectious diarrhoea and to create proper intestinal environment to prevent reinfection. In Enteritis, Irritable Bowel Syndrome(diarrhoea dominant), Diarrhoea or Dysentry of varied aetiology. As an adjuvant in Infective (Bacterial, Protozoal or Parasitic) Diarrhoea. Capsules Adults : 1-2 capsules twice or thrice daily. Children : 1 capsule twice or thrice daily.